As we've seen over the past few years, Australia was slow to embrace hip-hop - and when we did so, it was often only the highly commercial, occasionally novelty varieties of rap that scored highly on the ARIA chart. A band that helped open things up made their debut this week in 1992 with a song inspired by serious events. 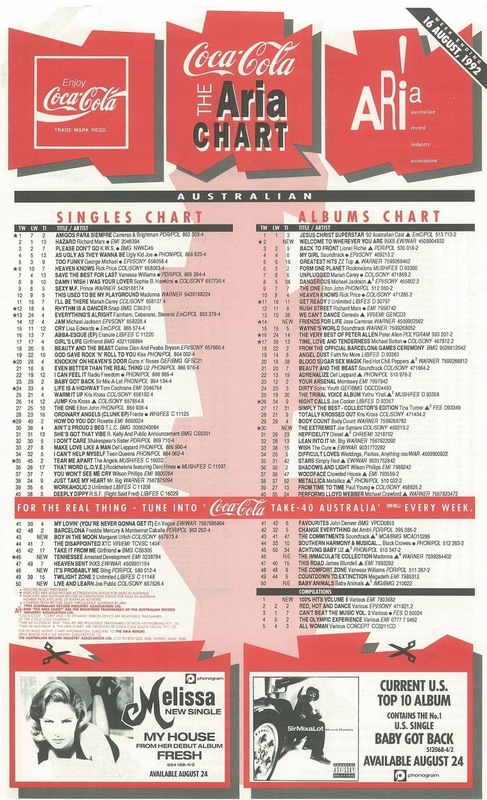 Meanwhile, the ARIA top 50 printout received another facelift this week in 1992, only five months after its most recent revamp had been rolled out nationally. Gone were the changing colours and landscape orientation, replaced by a red and black template (and lots of Coca-Cola mentions) that would remain until mid-1998. Sadly, the redesign meant the Breakers were no more - a section I had enjoyed seeing since it had been instituted in 1986. A new-look chart deserved a new number 1 - and it got one with "Amigos Para Siempre (Friends For Life)" vaulting up from number 7 for the first of six weeks on top. With vocals shared by Mick Thomas and Jen Anderson, this second single from Difficult Loves didn't live up to the success of "Father's Day" and it'd take another year for the band to return to the top 50. Her first three singles had all reached the top 20, but Melissa missed the mark in spectacular style with this fourth song, which was the only one that came out following the release of her debut album, Fresh. The fact that "My House" was already available coupled with it not being a very good song pretty much meant the single was doomed - something that was borne out by its peak outside the top 100. Most of the new jack swing tracks that'd so far made their presence felt on the ARIA chart had either come from male solo stars (like Bobby Brown and Michael Jackson) or male vocal harmony groups (like Color Me Badd and Boyz II Men), but this US top 5 hit was performed, co-written and co-produced by the members of four-piece band Joe Public. Packed with the amount of samples we'd come to expect from any modern R&B song worth its salt, "Live And Learn" was the only hit - here or in America - for the group. Sting's solo career, while not at Police levels of success, had started out pretty well, with one top 20 single each year between 1985 and 1987. Since then, his only hit had been 1991's "All This Time", which reached number 26. The only other times he's visited the top 40 (to date) have been with songs taken from movie soundtracks - the first one being this collaboration for Lethal Weapon 3. Although Eric Clapton is also a named artist on the track, the cruisy "It's Probably Me" involved input from saxophonist David Sanborn and Michael Kamen, who composed the score for the original Lethal Weapon, which is incorporated into the song. Sting's second movie hit would be another collaboration - and would take him back to the top of the chart in 1993. Although hip-hop was well established on the Australian chart by this point, it's still pretty remarkable a serious track like "Tennessee" did as well as it did locally. Yes, it has a strong chorus hook, but when you think about the types of hip-hop tunes that'd been really successful over the previous couple of years - "U Can't Touch This", "Now That We Found Love", "Ring Ring Ring (Ha Ha Hey)", "Sucker DJ", "Wiggle It", "Ice Ice Baby", etc. - they were generally much more poppy and/or gimmicky. Inspired by two deaths in frontman Speech's family, "Tennessee" was intensely personal and had a less polished, rawer feel to it. Assisting Speech (real name: Thomas Todd) on vocals were band member Aerle Taree (the horseshoes bit) and guest vocalist Dionne Farris (the part at the end). The song also included a snippet of Prince singing the word "Tennessee" in "Alphabet St" - a sample that wasn't cleared and would end up costing $100,000 after the fact. In 1991, Margaret Urlich had appeared on two back-to-back number 1 singles in Australia - but neither of them were her songs. The New Zealand-born, locally based singer had provided backing vocals for both "The Horses" by Daryl Braithwaite and Ratcat's "Don't Go Now". If only her own material was as successful. This pretty lead single from second album Chameleon Dreams became her latest release to land around the number 20 mark. "Boy In The Moon" was written and produced by the team behind "Escaping" and much of her debut album, however Margaret did branch out on Chameleon Dreams, working overseas with the likes of Rob Fisher (of Climie Fisher), Tony Swain (of Jolley & Swain) and Ian Prince (who'd worked on recent albums by Glenn Medeiros and Sheena Easton). Next week: the return of the king of new jack swing, plus the latest singles from two Australian pop acts who were on a hit streak. 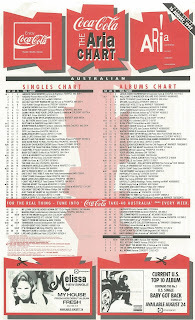 I have to say, this ARIA chart design was probably my least favourite... so of course it stuck for the longest time. The charts were foolscap-sized too, so could no longer neatly fit into my chart folder without chopping the bottom (which later appeared with a scissors symbol when it had competitions or promotions instead of singles of the week) off. I too missed the Breakers, as they occasionally gave an insight into what was lurking beneath the top 60 when rage was the only source of chart data beyond the top 50 I had. "Come to my house baby come on" has to be up there with "I'm in love with a girl called Amanda" for banal chorus lyrics. The pitch warping in the video you've embedded makes it even more comical. I think the single flopped also because its release was delayed until November, by which time the momentum had truly gone, despite initially appearing in the ARIA Report new releases schedule for August. Lack of promotion may have been another factor - I only heard the song once at the time, on the radio. I liked 'Live and Learn' more than much of the other similar-sounding r&b stuff out then. I thought 'Tennessee' was OK, but the next 2 singles were quire irritating. 'Boy In the Moon' would be my favourite Margaret Urlich track that I know. Pity it couldn't quite make the top 20.